Four work surfaces for four times the fun! Panels on each side of this easel adjust from 36" high to 46½" to accommodate children of varying heights. The easel measures 46½" tall, with work panels that measure 24" × 24". Sturdy maple legs support the included hardboard panels. Each easel includes clips and paint trays. 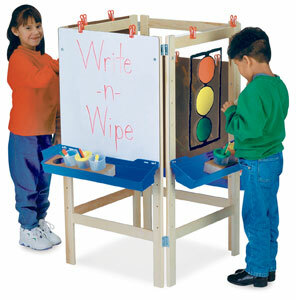 Optional acrylic, chalkboard, and dry erase easel panels (shown) are available separately. Assembly is required. The entire unit folds flat for storage. Lifetime warranty. ® Jonti-Craft is a registered trademark.